The Common Public Radio Interface (CPRI) standard defines the interface of base stations between the Radio Equipment Controllers (REC) in the standard, to local or remote radio units, known as Radio Equipment (RE). 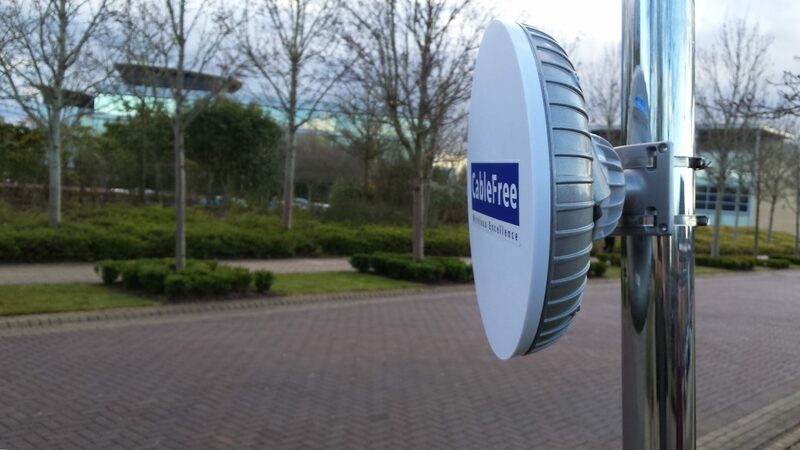 CableFree has pioneered the use of transparent uncompressed CPRI transport directly over wireless links at Nx 1.22Gbps to provide “Front Haul” from the remote antenna location to centralised base station infrastructure with distances up to 10 to 20km. For Cellular 3G/4G/LTE operators, “Front Haul” links using CPRI are offered which allows remote positioning of the base station antennas, enhancing coverage and increasing flexibility of network deployment. We have coined the term “Wireless to the Antenna” (WTTA) as a complement to the existing term “Fibre to the Antenna” (FTTA). FTTA architecture has enabled lower power requirements, distributed antenna sites, and a reduced base station footprint than conventional tower sites. WTTA using transparent CPRI links operating at 1.22Gbps or 2.5Gbps means that the Remote Radio Heads can be located up to 10 or 20km away from the Base Station infrastructure, without requiring fibre optic cables, which can be expensive and difficult to lay. Usually, existing fibre runs are along city blocks at street level and do not go directly to the exact rooftop sites where the base stations are located. Conversely, Wireless “Front Haul” MMW or FSO units can be directly co-located along with the Base Station and Antenna infrastructure, and immediately deployed in minutes or just a few hours for permanent installations. A remote radio head is a remote radio transceiver that connects to an operator radio control panel via electrical or wireless interface. When used to describe aircraft radio cockpit radio systems, this control panel is often called the radio head. In wireless system technologies such as GSM, CDMA, UMTS, LTE this Radio equipment is remote to the BTS/NodeB/eNodeB, and is also called Remote Radio Head. These equipment will be used to extend the coverage of a BTS/NodeB/eNodeB like rural areas or tunnels. They are generally connected to the BTS/NodeB/eNodeB via a fiber optic cable using Common Public Radio Interface protocols. Remote radio heads (RRHs) have become one of the most important subsystems of today’s new distributed base stations. The remote radio head contains the base station’s RF circuitry plus analog-to-digital/digital-to-analog converters and up/down converters. RRHs also have operation and management processing capabilities and a standardized optical interface to connect to the rest of the base station. This will be increasingly true as LTE and WiMAX are deployed. Remote radio heads make MIMO operation easier; they increase a base station’s efficiency and facilitate easier physical location for gap coverage problems. Note that generally bit rate options 1,2,3 are available over MMW, and 1,2 over FSO. These can be “aggregated” using 2+0 and higher (4+0, etc) links to provide higher capacities, for example where more LTE sectors are required. Continuing Advances in MMW and FSO transmission will enable transport of higher CPRI line rates up to 10Gbps for example.